Hi all someone just mentioned Farnham Maltins on the radio...... and it made me think what ever happened to the Jag spares morning there ? Nice little venue...was this time of year wasn't it ??? Just a thought . that was a long time ago. I guess 80s ? It was still going in early 2000's I visited there with Angus Moss and a few others. 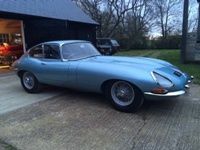 I live local and attended each year, however, towards the end it was a shadow of its former self with very little of interest to those looking for jaguar related parts, most of the major suppliers stopped attending. Stoneleigh started 2 events annually, November and March?